The World’s Water 2002-2003 offers a snapshot of our progress in addressing the global water crisis. It is the third in a series of books authored by the Dr. Peter H. Gleick and the Pacific Institute. This book is an effort to explore, understand, and solve a variety of critical water issues that include the global water crisis, global warming and water, privatization and globalization of water, and water-related conflicts. The central thrust of The World’s Water 2002-2003 is that we must rethink the way we capture, distribute, and use water if we are to meet the challenges of increasing scarcity and growing populations. In the lead chapter, the Pacific Institute’s director, Peter H. Gleick, spells out one possible solution to the growing water crisis: a “soft path” for water. The “soft path” for water, which borrows both its name and many concepts from Amory Lovins’ work on the soft path for energy, provides for the needs of people and the natural world by asking policy makers to rethink how, and what, we use water for. The chapter’s central insight is that people don’t so much want to “use” water as to accomplish certain tasks – they want to drink and bathe, produce goods and services, grow food and otherwise meet human needs. Other chapters cover the increasingly contentious debates over globalization and privatization of water, new measures of water well-being, the risks of climate change, and new information on dams and water. The book also includes several water briefs on issues including the search for water in outer space, an expanded historical chronology of conflicts over water, and over 20 newly update tables on everything from sanitation to irrigation. 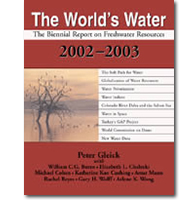 The World’s Water 2002-2003: The Biennial Report on Freshwater Resources was written by Peter H. Gleick with William C.G. Burns, Elizabeth L. Chalecki, Michael Cohen, Katherine Kao Cushing, Amar S. Mann, Rachel Reyes, Gary H. Wolff, Arlene K. Wong. Download the Introduction to the book (PDF).